The Carlsberg Soccer Sweepstakes is open only to legal U.S. residents who are at least twenty-one (21) years old. The Carlsberg Soccer Sweepstakes ends on December 31 at 11:59 p.m. ET. Send a text message with the word “CARLSBERG” from your handset addressed to “55755”. Then, you will receive a text in response which will contain a link to a website with the entry form. Complete the entry form by following the on-screen instructions. 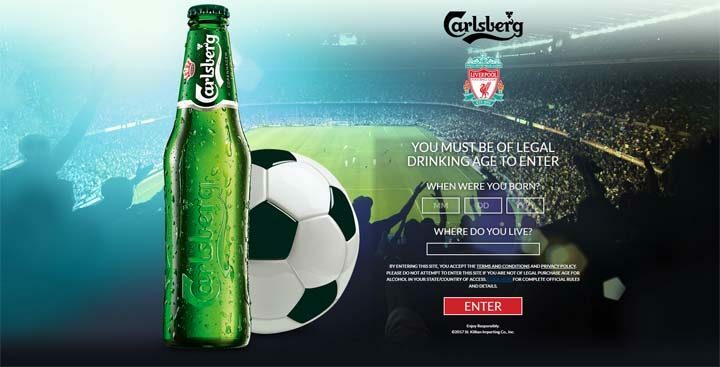 Alternatively, you can go to ScoreWithCarlsberg.com and follow the on-screen instructions for entry. ONE (1) entry per person, regardless of entry method. ONE (1) Grand Prize will be awarded. Grand Prize Winner will receive a trip to Liverpool, England for him/herself and ONE (1) Guest (21 or older) for a Premier League Soccer Game. Total Approximate Retail Value (“ARV”) of Prize is $5,000.00.